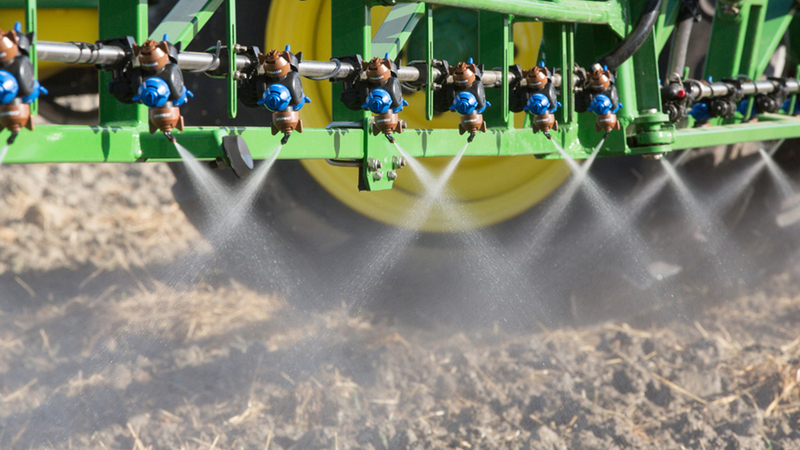 In recent years, Syngenta has been promoting the Defy 3D nozzle in the UK, which is a 100° flat fan, designed to run alternating 38° forward or backward along the boom. They prescribe a boom height of 50 to 75 cm, 30-40 psi, and travel speeds of 10 to 14 km/h in cereals and vegetables. Compared to a conventional flat fan, they claim that the angle and medium-coarse droplets promise less drift and improved coverage. Water-sensitive papers were originally intended as a coverage check, and not as a source of analysis, but their use revealed interesting information. The following images are the papers recovered after a single pass in each crop.